This over-sized beast of a ride tears up the road with big power and unmistakable attitude. Dual Disk Front Brakes: Keeping your mind clear and soaking up the freedom of the open road means not fretting about your ride. Especially when it comes to stopping. High performance, sleek design, the dual disk brakes feature 4-piston fixed calipers out front grabbing on floating rotors for superior stopping power. Drag-Style Handlebar: The Fat Bob® motorcycle features an internally wired 1 1/4" bar with tall risers. This beefy handlebar is truly reminiscent of an aggressive quarter mile monster. And with the wires routed through the steel, you get a clean, minimal look with nothing standing in your way of the open road. Aggressive Front End: With its wide stance and fat styling, the Fat Bob® comes on like a back-alley brawler: big, bold and dripping with attitude. 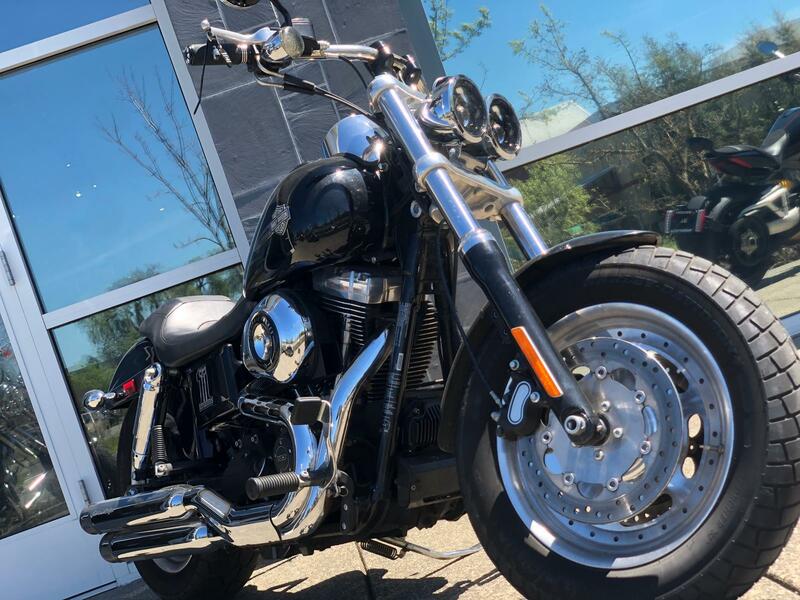 Muscled up forks, huge headlamp and a 16-inch front wheel wrapped in a 130mm tire give it a menacing, all-business stance and powerful performance. 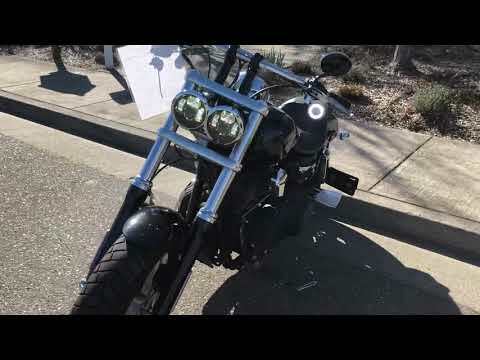 Dual Front Chrome Headlamp: Twice the custom style. Twice the badass attitude. The Fat Bob® model features a distinctive cast chrome double headlamp bucket that blasts open the night so you can see everything in your path. And with double the chrome coverage of a single bucket, you're bound to turn twice as many heads on the boulevard. 2-1-2 Exhaust: Welcome to the crossroads of pure Harley-Davidson style and smart engineering. The 'Tommy Gun' 2-1-2 exhaust increases exhaust flow to provide heart stopping performance, signature Harley-Davidson rumble, and big style. Chrome Covered Rear Shocks: Lowered and drenched in genuine Harley-Davidson® chrome, the rear suspension on the Fat Bob® motorcycle features high-performance coil-over rear shocks that provide a smooth ride and help strike the bike's eye-catching balance of chrome and darkness. Fuel Tank Medallions: When it comes to motorcycles, there's one name that people will never mistake for another: Harley-Davidson. The Fat Bob® model features the Harley-Davidson® Bar and Shield proudly displayed on the tank. Consider it your badge of honor bolted on the side of your bike so everyone can see exactly how you roll.